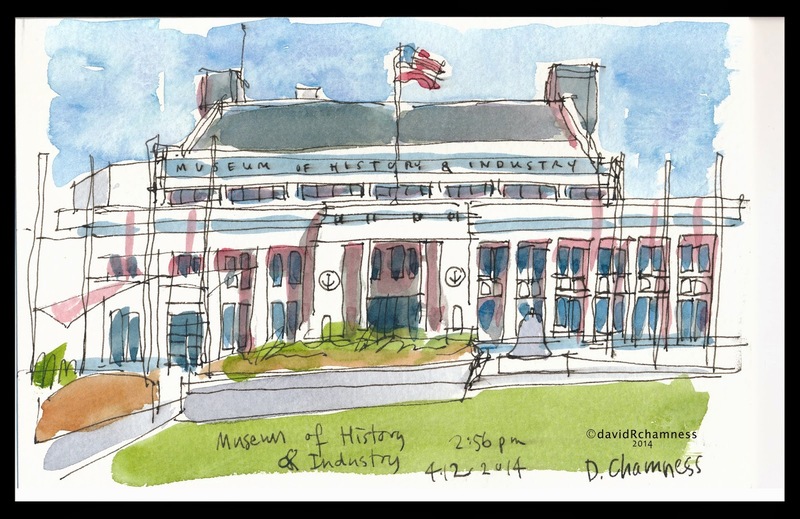 I completed a second opportunity as Sketcher-in-Residence at the Museum of History & Industry yesterday afternoon. It is a honor to participate in Gabi's exhibition and be a representative of Seattle Urban Sketchers while having a great time sketching. Yesterday I had a sketcher waiting for me as I arrived and soon had a second, with both wanting to participate in a sketch outing with other sketchers. The weather was so perfect this weekend that it was quickly decided to go outside and enjoy the opportunity to be in the sunshine. We sat at the water's edge in front of the armory and looked south toward all the South Lake Union construction sites. 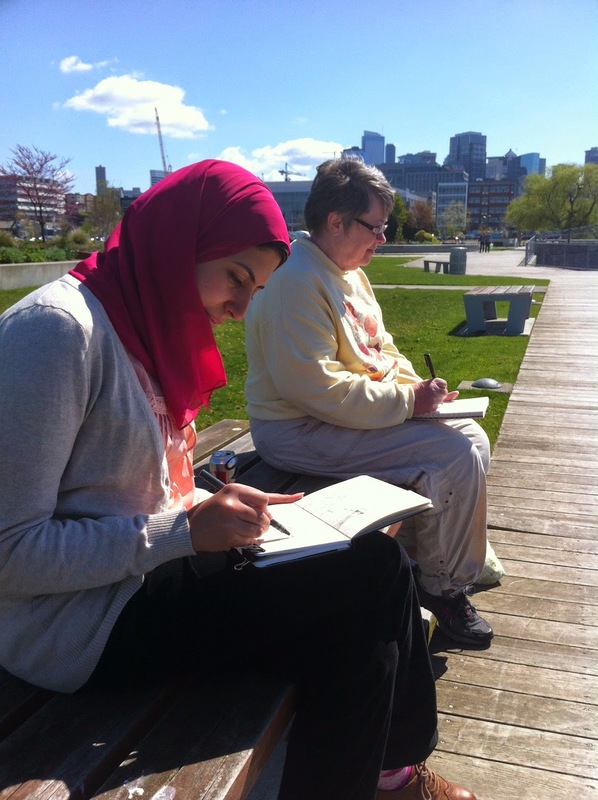 We all enjoyed the conversation, the warm sun and I also passed on helpful tips to the two new enthusiasts of urban sketching. As our time was nearing the end, I slipped in one more sketch of the front of the Navel Armory Building. By the time I finished, I was half blinded by the light reflecting off the white of the paper in my sketch-pad. Thanks again to The MOHAI and Meris for coordinating the volunteer sketchers! If you haven't had a chance to see Gabi's exhibition, please go and see it before it is finished at the end of May. Good work, David! Your sketches are excellent, as always. I'm sure you had some good tips for your participants. My next day is 17 May and I'm hoping for good weather so we can go outside, too!